There are two types of herpes simplex virus. Type 1 herpes simplex virus is the usual cause of cold sores around the mouth, and herpes simplex infection in the eye. Type 2 herpes simplex virus is the usual cause of genital herpes. It rarely causes cold sores or eye infections. The first time you are infected is called the primary infection. Most people become infected with this virus, often during childhood. (The herpes simplex virus can pass through the moist skin that lines the mouth. It is commonly passed on by close contact such as kisses from a family member who has a cold sore.) In many people the primary infection does not cause any symptoms, although in some cases symptoms do occur. Following the primary infection, the virus stays with you for life. It stays inactive (dormant) in the root of a nerve in the face (the trigeminal nerve). In many people, the virus remains permanently inactive and causes no problems. In some people, the virus re-activates and multiplies from time to time. Virus particles then travel down the nerve and can cause episodes of active infection with symptoms. If it travels down the nerve to the eye, it may cause eye problems. Which part of the eye is affected with herpes simplex infection? The cornea is commonly affected. The cornea is the transparent ‘window’ of the eye. Infection of the cornea is called keratitis. 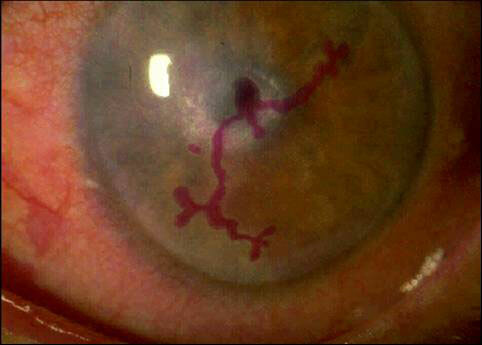 In most cases the infection is just in the top layer (superficial layer) of the cornea. 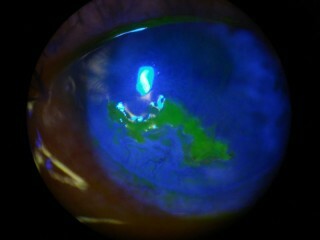 This is called epithelial keratitis. Less commonly the deeper layers of the cornea are involved. This is called stromal keratitis. This is more serious as it is more likely to cause scarring of the cornea. Other parts of the eye are sometimes affected. A minor and temporary inflammation of the conjunctiva (conjunctivitis) or eyelids (blepharitis) may occur with active infection. Deeper structures such as the retina or iris are sometimes affected. Ache or pain in the eye. Redness of the eye – mainly around the cornea. Photophobia (discomfort when opening the eyes in bright light). Treatment is with antiviral eye ointment or drops (such as aciclovir ointment or ganciclovir drops). These do not kill the virus but stop it from multiplying further until the infection clears. You should take the full course exactly as prescribed. This is usually five times a day for two weeks, but sometimes more. The aim is to prevent permanent damage to the cornea. Treatment is similar to epithelial keratitis (above). In addition to the antiviral eye ointment or drops you may require steroid eye drops to reduce inflammation. Note: steroid eye drops must only be used under close supervision of an eye specialist who will prescribe the correct strength and dose in conjunction with antiviral treatment. Used wrongly on their own, steroid drops cause more harm than good. No treatment may be advised. These infections will usually settle on their own in 1-3 weeks. You are likely to be kept under review until the infection goes to check that the cornea does not become infected. Some people develop recurring episodes of active infection. As mentioned above, these occur if the virus ‘reactivates’ from time to time – similar to cold sores. At least half of people who have one episode of active infection will have a recurrence within 10 years of the first. In about 1 in 10 cases, the recurrence is within a year. Recurrences occur more often in some people than others. If the recurrences are frequent (say, once a year or more) or severe, then you may be advised to take long-term lose dose steroid eye drops or antiviral tablets (aciclovir 400mg twice a day) each day to prevent episodes of active infection. Regular eye examinations are essential if long-term steroid drops are used, to check for side effects, especially raised eye pressure which may lead to glaucoma. Regular blood tests are required if tablets are used, as they may have effects on blood counts and liver function. Some people find that episodes of active herpes infection may be triggered by strong sunlight. Wearing sunglasses may also help to prevent recurrences. If a recurrence does occur, each episode is treated as described above. The main concern with corneal infection (keratitis) is that it can cause scarring. With scarring the normally clear and transparent cornea become like ‘frosted glass’. This can affect vision. Epithelial keratitis tends to settle and go away in 1-2 weeks. It has a good outlook and often causes little or no scarring. Stromal keratitis is more likely to result in corneal scarring and loss of vision. Recurring episodes of active infection can make any existing scarring worse. Prompt treatment with antiviral eye ointment or drops helps to minimise damage during each episode of active infection. Overall, about 9 in 10 ‘involved eyes’ maintain good vision (good enough to drive). However, severe and recurrent infections may lead to serious scarring and blindness. If blindness develops, a corneal transplant is then the only option to restore vision.